The Whitney Museum of American Art in New York has announced the list of artists who have been selected to participate in the upcoming 2012 Whitney Biennial. 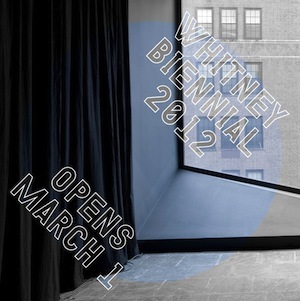 The 2012 Whitney Biennial will be the 76th edition of the ongoing series of Biennials and Annuals, that has been presented by the Whitney since 1932. This years event will take place at the Whitney, on Madison Avenue, from 1st March through to the 27th May. The Whitney Biennial is eagerly awaited as an indicator of the current state of contemporary art in the United States. The exhibition will include painting, sculpture, photography and installation, from both emerging and established artists. The 2012 Biennial is being curated by Elisabeth Sussman, Curator and Sondra Gilman Curator of Photography at the Whitney, and Jay Sanders, a freelance curator. The Curators began research and work on the whole project back in December 2010. In that time they have pulled together a list of 51 artists who are to participate in the exhibition next year.